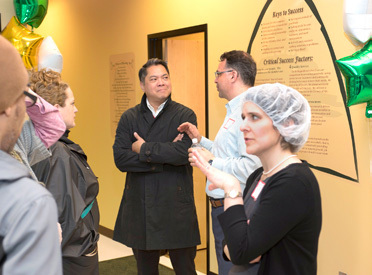 Claude Karam, owner of Trazza™ Fine Lebanese Food, held a Grand Opening at his new Tualatin production facility on Wednesday, March 15. He treated more than 50 attendees to a tour of the 7,500 square-foot facility. Open House guests also enjoyed Lebanese fare, including an assortment of Trazza’s hummus, falafel, baba ghanouj, tatziki sauce, tabouleh, mhishi (stuffed grape leaves) and baklava. An obvious family man, Karam said he left his 15-year career as an Alaska Airlines pilot to spend more time at home…..